Additional Info: Contraction band necrosis (CBN) – Contraction band necrosis is a form of irreversible myocardial injury. It may occur in the setting of reperfusion injury to thy myocardium or experimentally with the administration of catecholamines. The process is mediated by fluctuations in both intracellular and extracellular calcium concentration and is thought to be ATP dependant. 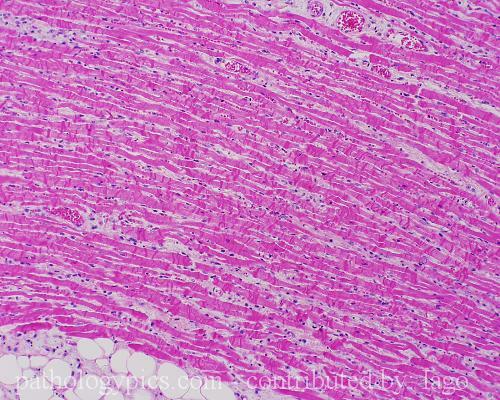 CBN is a helpful histological sign when dating myocardial infarctions. It is usually observed in the myocardium within the first 12-24 hours of irreversible injury. Along with coagulative necrosis and colliquative myocytolysis, CBN in one of the 3 distinct structural patterns of myocardial cell injury and death.